Probably supplied to William Ferguson of Raith, Kircaldy, Fife, and by descent. 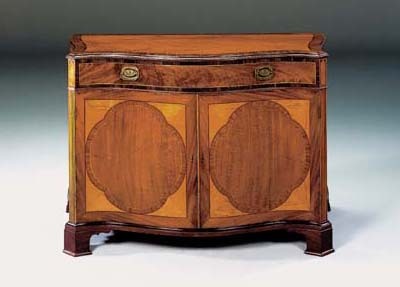 The commode's serpentined and cut-cornered top features in a 'Dressing Drawers' pattern in Messrs. A. Hepplewhite & Co., The Cabinet-Maker and Upholsterer's Guide, l788, pl. 76. Its pilasters, with trompe l'oeil flutes are capped by Gothic-cusped panels of satinwood in mahogany tablets, and these contrast with the cusped quatrefoils of mahogany displayed in satinwood tablets on the doors. The dressing-drawer's stamped brass handles comprise cut-cornered tablets, whose bas-relief medallions are flowered with the Scottish thistle. Related 'thistle' handles feature on a Scottish commode at Malleny House, Scotland (see F. Bamford, 'A Dictionary of Edinburgh Furniture Makers 1660-1840', Furniture History, l983, pls. 86a and b).